You can set up Jenkins to monitor your Gitlab project for any changes. 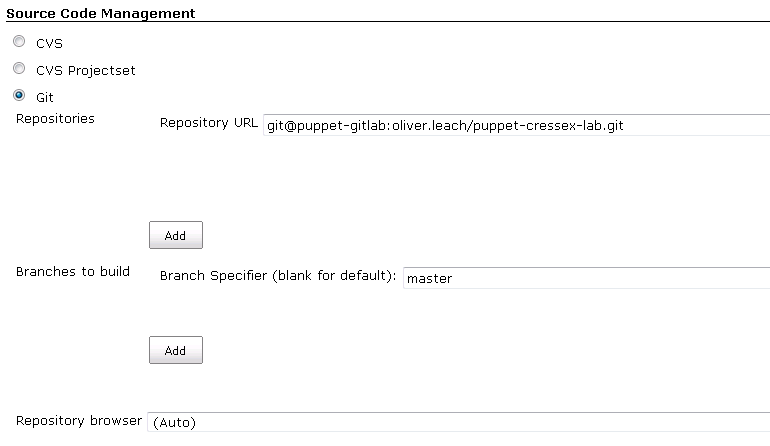 If Jenkins sees any commits to the master repo, Jenkins will execute a build script and run any customised scripts. Here is how to set this up. Set up a project in Gitlab. This will be your git repo. Create a your git repo using a git client on a linux box of your choice. Configure Jenkins job to poll the git repo and to run a build script if there are any changes. Here is how to configure the Jenkins server to poll the git repo. Under build triggers, select the Poll SCM and set a Schedule. The schedule is in cron format and be set as desired. Here we have set Jenkins to poll the git repo every 5 minutes for changes. We will need to set up ssh keys and sudo access for the jenkins_admin user which is used to log on to the puppet masters to sycnronise the manifests and modules. To set up the keys, run the following commands on the jenkins box. 4- Configure sudo on the puppet-master so Jenkins_admin is not prompted for the password. Note you can use a manifest to configure sudo via puppet.